I have been seeing the ever so gorgeous actress on a daily basis as she graces November's cover of Harper's Bazaar and think Anne Hathaway has never looked more beautiful than she does at this very moment. 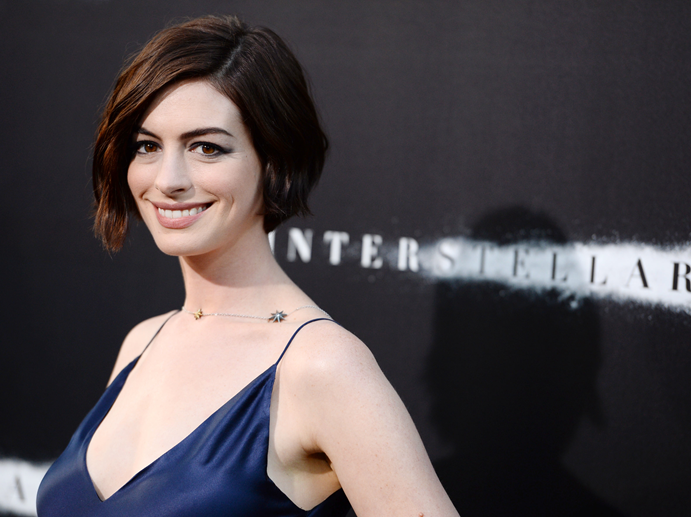 With that being said, Celebrity hairstylist Adir Abergel created the look for Anne Hathaway's red carpet premiere of ‘Interstellar’ using Leonor Greyl products last night. “I was inspired for the look by the midnight blue silk dress by Richard Nicoll and James Bank jewelry that she’s wearing. It reminded me of the girls in the early 90’s that wore those great slip dresses. I wanted to keep the look deconstructed to keep the same energy since the dress is flowing, so I created a look with effortless texture and movement with a 90’s edge. First, I started by applying Leonor Greyl Mousse au Lotus Volumatrice from the roots to midshaft to create volume and memory to the style. I didn’t apply any mousse to the ends of her hair to keep the weight around the structure of the head, right around the roots. Then, I created a deep side part following the arch of her brow. I applied Éclat Naturel on the ends to give it a little more separation but at the same time protect the hair from heat styling and then used a diffuser to dry her hair completely, making sure to scrunch the hair so that the natural texture came through. Once her hair was completely dry, I used a 3/4” curling iron and created a soft, defined wave by winding it around the iron. The secret to this kind of look is to curl from the roots to the midshaft, leaving the ends out. It’s really about just creating movement and a very loose wave, rather than a curl. This adds amazing texture and separation to give it that effortless style. I readjusted the deep side part so that it came down and covered half of one eyebrow; it really gave it that 90’s edge. I finished the look by using Leonor Greyl Laque Souple. This will lock in the style all night without weighing it down.